A leading medical center is working with RGB Spectrum to develop a specialized display and control solution to view high-resolution imagery and gain keyboard and mouse (KVM) control of multiple computer systems. Operating room personnel required high resolution image processing and they needed to control multiple computers providing vital imagery. 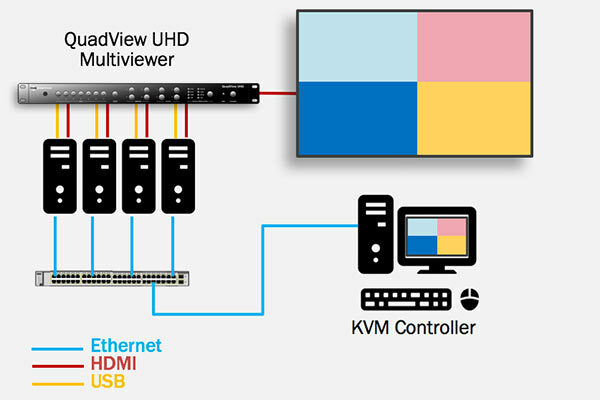 RGB Spectrum’s QuadView® UHD multi-image processor (multiviewer) is being integrated with custom KVM control to enable personnel to view and control a variety of sources in real time. Images are displayed in multiple windows on a single high resolution 4K monitor. Exclusive technology allows the staff to any computer displayed on screen with a single keyboard & mouse.